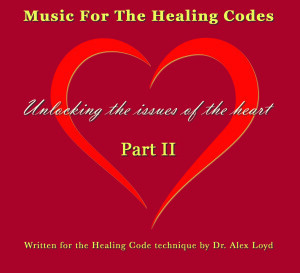 Now Available: Music for The Healing Codes Part 2! What's unique about this album? How is it different from Music for The Healing Codes Part 1? Music For The Healing Codes Part 1 was written for the Universal Healing Code, and each of the 12 songs had a duration of 6 minutes. Elio's focus with this music was to use special counter point melodies–that is, two independent melodies playing at the same time, much like baroque or classical music. It is these contrapuntal melodies that stimulate the brain to enter REM state and allows you to easily access the elevated function of the brain and benefit from the power of The Healing Code. Music For The Healing Codes Part 2 is 2 hours and 48 minutes worth of music, more than double the amount of music from Part 1! There are two key aspects of Part 2. Key Point 1: The selections are geared to the Healing Codes from The Healing Codes Manual, which contains 2 specific Healing Codes for each of the 12 Healing Codes Categories. Each piece of music has been written to the suggested minimum amount required for each category when doing both codes. So, for instance, the suggested time for Unforgiveness Codes is approximately 9 minutes, therefore 9 minutes of music has been written. This allows you to do both category codes uninterrupted; you wont' have to stop and replay the music. The music will enhance and amplify the healing effects of each Code. Key Point 2: The music has been specifically written between 40-60 beats per minute, proven to be the optimum tempo for healing, relaxation and meditation. Music at 60 beats per minute produces a calming effect by lowering the heart rate. It also helps to promote Alpha and Theta waves in both the left and right hemispheres of the brain, facilitating the experience of calmness and relaxation.